That old saying rings true…there is a first time for everything. 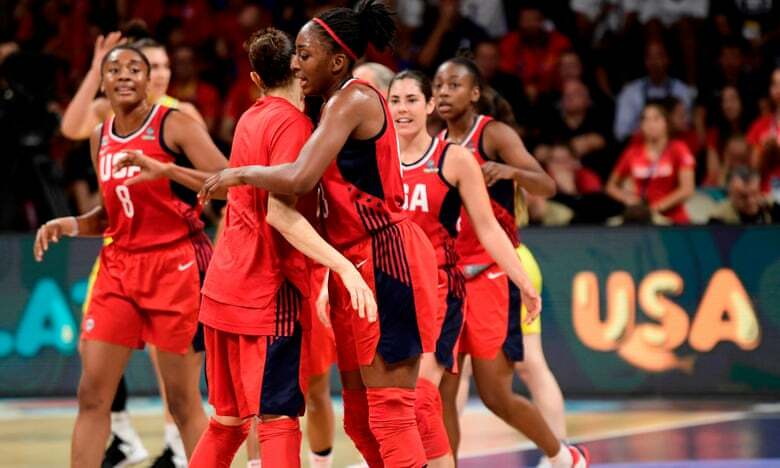 Just ask the USA Basketball women’s national team, who completed its bid for history on Sunday in Tenerife, Spain by defeating Australia by a final of 73-56. Unprecedented, but not impossible. These are gold habits. It is the first time that the FIBA World Cup has had a team win three consecutive gold medals. It is also their tenth gold of all time. The win also does something else besides claim a third gold for Team USA. It also automatically qualifies the Stars and Stripes for the 2020 Olympics in Tokyo, where the team will be aiming for their seventh consecutive gold medal. Heading into the game, most observers likely expected it to be one that would go down to the wire with Liz Cambage causing problems for Team USA. The Opals did only trail by five – 32-27 – at the half. But as was the case for the United States against Nigeria’s D’Tigress and The Belgian Cats, T third quarter was when Dawn Staley’s squad put it away. The USA outscored Australia 26-11, extending its lead to 61-38 and practically putting this one away. The year 2018 ought to be now officially considered The Year of Stewie. With 10 points and eight rebounds, Breanna Stewart was named FIBA World Cup MVP. This on top of winning regular season MVP and WNBA Finals MVP. 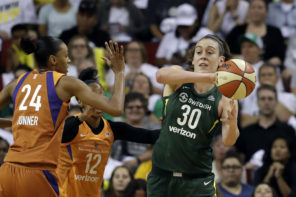 Brittney Griner led scoringwise with 15 points and her Phoenix Mercury teammate Diana Taurasi chimed in with four assists. Sue Bird had five assists and one of those was her 104th while donning the red, white, and blue which passed – ironically – her coach (Staley) for the most in USA Basketball’s history. As for Sandy Brondello’s Opals, Alanna Smith led scoringwise with 10 points. Jenna O’Hea had four assists. Liz Cambage did have 14 rebounds and five blocks, but Team USA’s defense held her to only seven points on only two out of 10 from the field. Needless to say, the way the defense locked down on Cambage was the difference in this one given Cambage’s proficiency as a scorer and a presence. After the game, it was announced that Stewart, Taurasi, and Cambage all made the FIBA All-Star Five team along with Belgium’s Emma Meesseman and Spain’s Astou Ndour.